Hi Guys, At present time there are lot of tips and tricks available on the internet. These tips and tricks are very useful for us. But due to lack of knowledge we don’t have to use these tips and tricks. We believe that knowledge is always help us. Today we have to discuss an important tips and trick from which you will be able to start playing dinosaur game on offline Google Chrome browser on your Smartphone or PC. We know lot of person like to play games on his smartphone. Most of the person utilize his boring time by calling to other person, start chatting using WhatsApp, Watching movies or playing games. If you want to talk to other person then you have to pay call charges, if you want to start chatting via WhatsApp, watching online movies or playing online games on his smartphone then you must need internet connection. But this trick helps to start playing dinosaur game on offline Google Chrome browser on your Smartphone or PC. 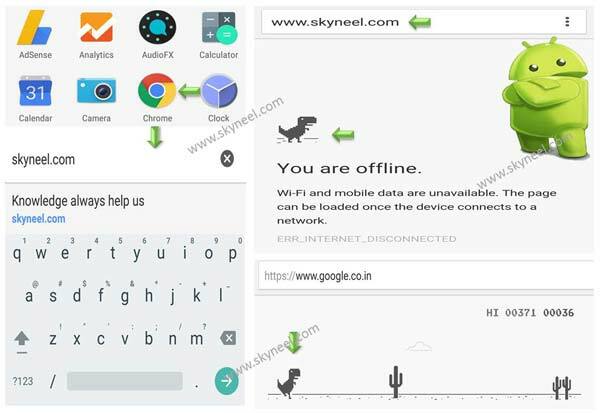 There is no need for internet connection if you want to start playing dinosaur game on offline Google Chrome browser on your Smartphone or PC. This guide is useful for those uses who want to spend his boring time by playing games on his Android without using internet. If you want to start playing dinosaur game on offline Google Chrome browser on your Smartphone or PC, then you must take following steps. After playing this game you will get full enjoyment. Step 1: Tap on the Chrome browsing software on your Android phone. Step 2: Make sure your internet connection is turnoff on your Android phone. If internet connection is turn-on then turn off Wi-Fi or Data connection on your smartphone. Step 3: Tap on the search or type URL box and type and word or characters in the search box of your offline Google chrome browsing window. Step 4: After typing the characters or word in search box press enter key. It will shows an message on your screen “You are offline”. Step 5: Now tap on the dinosaur icon single time. Finally your game will be start on your Android phone. Little dinosaur is start running and you will get few cactus in your game. You have to tap on your screen to jump the little dinosaur and get the points. If you jump over the cactus then you game will be over and you have to tap on start playing again button. I hope this article is like by all those person who want to spend his boring time by playing the game on Android phone. After reading this article you will be able to easily to start playing dinosaur game on offline Google Chrome browser on your Smartphone or PC. Kindly share your knowledge with your friends, family members and others and give important suggestions in the comment box. Thanks to all.